No. 12, Jalan Bateri 34/5, Taman Perindustrian Bukit Kemuning, Section 34, 40470 Shah Alam, Selangor, Malaysia. 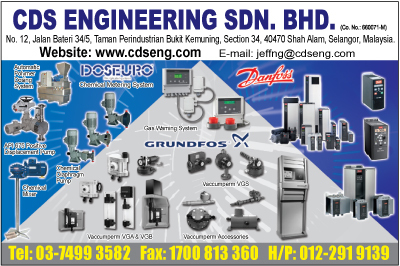 CDS ENGINEERING SDN BHD was incorporated as a qualified engineering equipment and system supplier to provide good and excellent integrated engineering solution for water treatment plant, particularly in bulk and liquid chemical handling. CDS are capable to carry out a whole turnkey chemical system design in order to give a global engineering solution toward achieving customer needs and satisfactions. Over the years with expertise and experienced acquired in the project implementations, CDS Engineeering Sdn Bhd also import advanced and excellent equipment being applied oversea water and wastewater treatment plant. CDS will place much emphasis not only on equipment supply but global solution as we perceive it as a vital factor to our customer and provide us with a competitive edge against other equipment supplier.